If I could get git-log to order commits by the author timestamp instead of the committer timestamp, this would be solved. Does anybody know of a way to do that? For those visiting this from Google results, you may want to look into josephdpurcell's solution (and in-depth blog post! ), below. 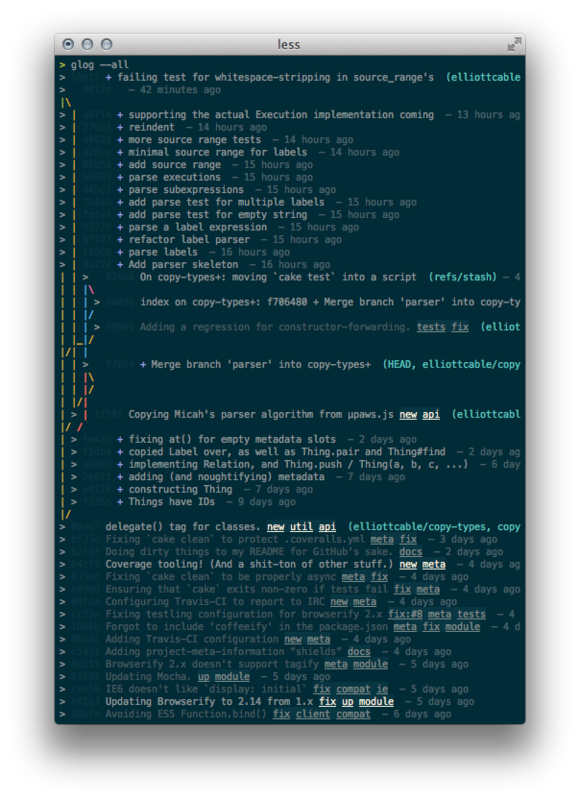 It's quite excellent, if you're looking for standard git-log style output, multi-line, with detailed messages about each commit. Unfortunate, I now need to amend this question, because I'm an idiot and didn't provide more specific information about my use-case: I use git-log in “--graph mode,” and I need to make git-log itself operate in author-date-order. As far as I've been able to ascertain, this is completely impossible to do from outside git-log, because git-log itself handles the graph ordering and printing. git version 1.8.4 added an --author-date-order argument to git log; according to the release notes, "the output is topologically sorted and commits in parallel histories are shown intermixed together based on the author timestamp." You can find this script and others in Git Extras on GitHub. --date-order/--topo-order really just controls the ordering of commits in a revision list when you are viewing multiple branches running alongside another. The "x is-a-parent of y" relationship is always respected, even if your committer/authoring timestamp is in the distant past or future. You'd need something like git log --pretty="format:%at %H" | sort -g and then feed the hashes back into git log. Building off of what jørgensen suggested there is a "one-liner" solution that may give you what you are looking for. Formatted here for easier viewing. Improvements are welcomed! Not the answer you're looking for? Browse other questions tagged git sorting timestamp git-log or ask your own question. git: Is there a command line option for “Sort by date” for gitk?